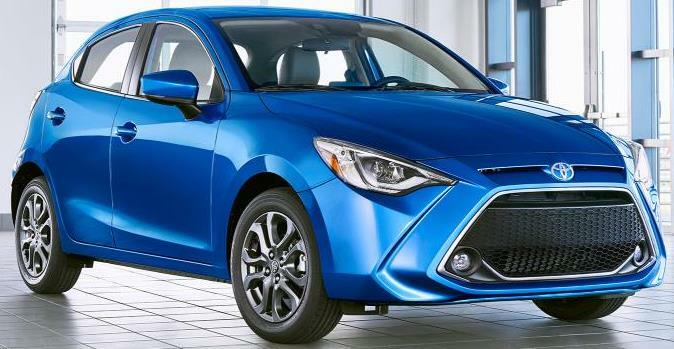 The 2020 Toyota Yaris, offered in mono-spec LE and XLE grades, has a wheelbase nearly 2.4 inches longer than the previous Yaris Liftback model and powered by a 106 horsepower 1.5-liter inline four-cylinder engine mated to a 6-Speed automatic transmission with Sport Mode that delivers an estimated 40 MPG highway fuel economy. The 2020 Yaris Hatchback comes equipped as standard with a Low-speed Pre-collision Safety System scaning the road ahead for potential vehicle collisions. Also standard is a Dynamic Stability Control, Traction Control System, Anti-lock Brake System, Electronic Brake-force Distribution, Brake Assist and Brake Override System. The Yaris Adventure subcompact pickup version with a 52.3-inch bed has a payload of 297 lbs., will make its debut in its native environment of the 2019 New York International Auto Show.